HomeTour DatesNEWS: May will bring Trade Wind! NEWS: May will bring Trade Wind! May will bring Trade Wind, a super group of sorts that features Stick To Your Guns vocalist Jesse Barnett, Stray From The Path guitarist Tom Williams alongside Will Putney’s right hand man bassist Randy LeBoeuf and Structures drummer Andrew McEnaney. 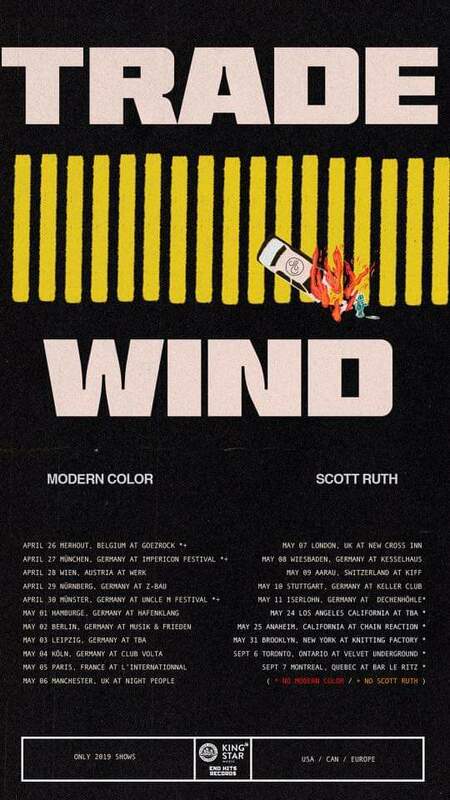 They’ll be on our soil for a pair of shows with Modern Color and Scott Ruth. The tour may also allow for Stick To Your Guns Guitarist Josh James to get some shows in with Eighteen Visions. NEWS: Reading & Leeds Festival(s) announce first wave of bands! NEWS: ArcTanGent festival announce first wave of bands! NEWS: Cancer Bats add pair of June shows!